Specialist hot tub distributor Spa Solutions has secured an exclusive deal to supply the innovative IKON model from Vortex Spas to the UK market that will be promoted during SPATEX in Coventry. Essex-based Spa Solutions Managing Director Anthony Schneikert has previously promoted the WhatSpa? Best Buy Award-winning USA brands Alps Spas and Viking Spas at major UK and European exhibitions and has now linked up with Vortex Leisure; which is proclaimed to be the largest spa and swim spa supplier in the Southern Hemisphere and is renowned for producing high quality hot tubs backed up by clever design and excellent customer service; to launch the IKON, pictured, at SPATEX that is being staged from January 29 to 31 at the Ricoh Arena. 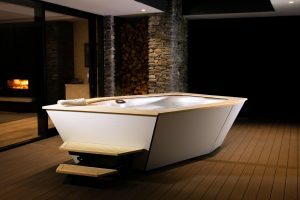 “In addition to the new IKON spa, we’ll be offering retailers a number of Vortex Spas for the first time within the mid-range price bracket that incorporate all the features of a high-end produced spa,” revealed Anthony. Vortex Spas is part of the integrated Vortex Leisure Group, which owns Spa World, Spa Store, Banff Spas, Arcadia Spas, Fisher Spas, Lifestyle Spas and distributes spa pools and swim spas under various brands to over 20 countries around the globe. The supply agreement with Spa Solutions comes hot on the heels of a successful European launch of the IKON at Piscine Global Europe in Lyon. Commenting on the new distribution deal for the UK, Vortex Leisure Group CEO Andrew Pullen revealed that he is thrilled to partner with a company that has the same philosophies around ‘innovation, workmanship and customer service’ that Vortex does. “This partnership will open exciting opportunities for UK spa retailers to enhance their offering,” said Andrew. Andrew says the Vortex Spas team was overwhelmed by the response to the IKON at Lyon. It has been created from the design of 36-year-old global product designer Alain Brideson, and inspired by luxury marine and modern architecture. Features include contoured landscape seating, a Flexiteek deck similar to those found on super yachts, architectural cabinetry with flush, screwless surfaces and contemporary negative detailing. As part of the promotion for the IKON ahead of being showcased to the UK trade by Spa Solutions at SPATEX, Anthony revealed that the IKON has a shape that is completely different to anything else available in the UK. “We feel it’ll be extremely popular as it offers an incredibly stylish design that works well with modern architecture and contemporary living,” said Anthony. New Zealand-born designer Alain Brideson was determined to come up with something ‘undeniably beautiful’ from the outset as part of the design process for the IKON. “From the beginning I wanted to create a spa pool that architects wouldn’t want to hide. Disrupt and redefine,” divulged Alain. IKON ambassador and famed Olympic Gold Medal-winning Australian swimmer Ian Thorpe has been brought into the promotional fold to highlight the launch of the hot tub and the benefits of hydrotherapy. He revealed that when he was swimming competitively the use of spa pools were a regular part of his recovery after training. As part of his role as an ambassador for the IKON, which is currently exclusively available through Spa World stores in Australia and Vortex Spas in New Zealand, Ian believes the stylish appearance and innovative design ensure it can fit perfectly at his ultimate location of a deck overlooking water, or locations throughout the world. 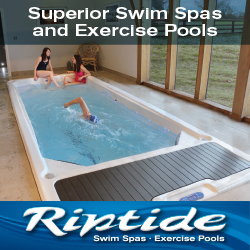 For further information and to find out more about the opportunities for becoming a retailer of the IKON and other Vortex Spas hot tubs visit the Spa Solutions Stand F58 during SPATEX at the Ricoh Arena, from January 29 to 31. The IKON will be available to retailers on special order from Spa Solutions from January 28.